For more than four centuries the people of Tonbridge have benefited from a charitable trust whose trustees are known as the Wardens of the Town Lands of Tonbridge, or Town Wardens for short. The charity is known to have been in existence by 1571, making it one of the oldest in the land, and it is still active. 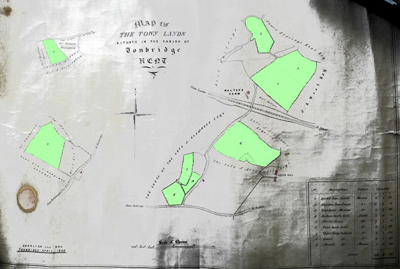 The charity drew its income from letting out a number of fields, known as the Town Lands, which had been bequeathed for the benefit of the town by benefactors whose names are now lost. One of these Lands is mentioned in a document as early as 1431. For years the duty of the Town Wardens was to use the profit from letting the Town Lands for the upkeep of bridges and roads in the town. Today there is a wider remit: to distribute income from the trust ‘for the benefit of the community at large’. A history of Kent written in 1570 describes Tonbridge as a town of bridges ‘for in deede it hath many’. Travellers through the town were confronted by five hump-backed stone bridges in quick succession. The northernmost one, known as the Great Bridge, now spans the main stream of the Medway, while the southernmost, the Lower or Little Bridge, crosses the southern branch of the river. Between these were three smaller bridges, no longer apparent, over lesser streams. All of these bridges were subject to wear and tear from traffic and frequent flooding, and the ground between them was often boggy and sometimes impassable. In the words of a document dated 1575, the Town Wardens were required to use the income from the Town Lands ‘to sustain and maintain and newly to re-edify [i.e. restore and reconstruct] all the Bridges in the Town of Tonbridge (excepting the Great Bridge which the Lord of the Town is in right to maintain)’, with any surplus to go in ‘the amending of the ways’, i.e. improving the roads, in the Town. The Wardens’ accounts* show that much of the income from the Town Lands went on acquiring cartloads of stone, lime and sand for repairing the four bridges, and on 'paving' lengths of road - the process of resurfacing the roadway by spreading stones on it and ramming them down. The Wardens also paid for the provision of ‘clappers’ between the bridges. These were raised wooden walkways, some with handrails, which enabled pedestrians, and even horsemen, to avoid muddy or water-logged sections of road. Bread and beer for the workers is another expense frequently recorded in the accounts. *A transcript of the Wardens’ accounts from 1575 to1760 can be found here. The 1575 document names eight Wardens. When three of these had died, three more were to be appointed, and so on in perpetuity. In practice however two Wardens were elected every three years. Over the centuries, generations of elected Town Wardens have performed their duties, sometimes conscientiously, sometimes neglectfully, and occasionally, it seems, fraudulently – as when some of the Wardens were found to be planning to sell off Town Lands for their own benefit. Surviving lists show that the Wardens were often members of families which had been part of the close-knit Tonbridge community for generations. In addition to landowners such as the Woodgates and Childrens, they include farmers, professional men, tradesmen and craftsmen. The Town Lands have now been sold - the last in 1950 - and the money invested, earning interest that is currently around £2500 a year. Since the roads and bridges are now the responsibility of the County Council, the Wardens use this money to benefit the local community in other ways. Some recent grants have gone towards the provision of wooden gates for the Castle Gatehouse, new seats at the Parish Church, playground equipment at Tonbridge Farm, refurbishment of the clock by the Big Bridge, and, appropriately, towards the refurbishment of the Little Bridge in the High Street. In 1972 the Town Lands charity was amalgamated with another local charity of similar aims and antiquity. The resulting body is known as The Tonbridge Town Lands and Richard Mylls Charity. Today there are four Wardens in post at any one time, trustees of the joint charity. They are appointed by the Borough Council. Today’s Town Wardens maintain the long tradition of ensuring that benefactions made centuries ago continue to benefit the people of Tonbridge today. Among the grants made by the Wardens in recent years are contributions to the provision of new doors for the Castle gatehouse, and the refurbishment of the Little Bridge and the Town Clock.